ANOTHER cyclist riding irresponsibly, another driver found not guilty and persecuted by the police and the CPS. When are motorists going to get a fair deal and be listened to? When are cyclists going to learn that riding a bike is not something any sane or professional person does? It is not Call the Midwife in 2014! Someone has died because you all fail to follow the rules, as cyclists do every day. Even if you did, so what? No driver wants to hit you, so stop this happening: give up. We, the motorists, have won, the roads are ours now. It doesn’t matter who campaigned for what, it doesn’t matter that it’s healthy; the motorist outnumbers you 35:1. We weigh 2000kg, you weigh 70kg. Editor’s note: Steven Petterson was last week found not guilty of causing death by careless driving in relation to the fatal collision he was involved in with cyclist David Irving in Southampton. However, there was nothing offered in evidence during the trial to suggest that Mr Irving was in any way responsible or to blame for the collision, which took his life in December 2012. I can’t believe that a responsible newspaper would print this kind of thing. Wow. Just… Wow. That goes beyond the word “insensitive” to choose to publish a letter like that. get in the car like any rational person would. Local rag publishes frothing flame-bait from local nutter to increase clicks and comments. Be interesting to see if he applies the same logic to pedestrians killed by cars, or even drivers killed in car crashes? I’ve learnt in life that some people are just ****s, such as the author of that bile, and let them be that way. well the troll is getting exactly what he wanted. cyclists wound up. So sad that the paper feels the need to stoop to that level though. They’re very much in cahoots with the new forest lot which are trying to ban as much cycling in the forest as they can. The comments section go’s on and on with a few well known (on the papers board) elderly anti cycling regulars, who are just unbelievable in the their views, very much like the letter. It seems Mr Rigby has former, his last reader’s letter was “Prime Minister should ban cyclists” December 12 2013 complaining about cyclists causing congestion. You can see by the number of comments why they publish his drivel. Trouble is, like any editor/journalist responsible for publishing this crap, they will find ways to justify themselves. Otherwise, how could they do the job. 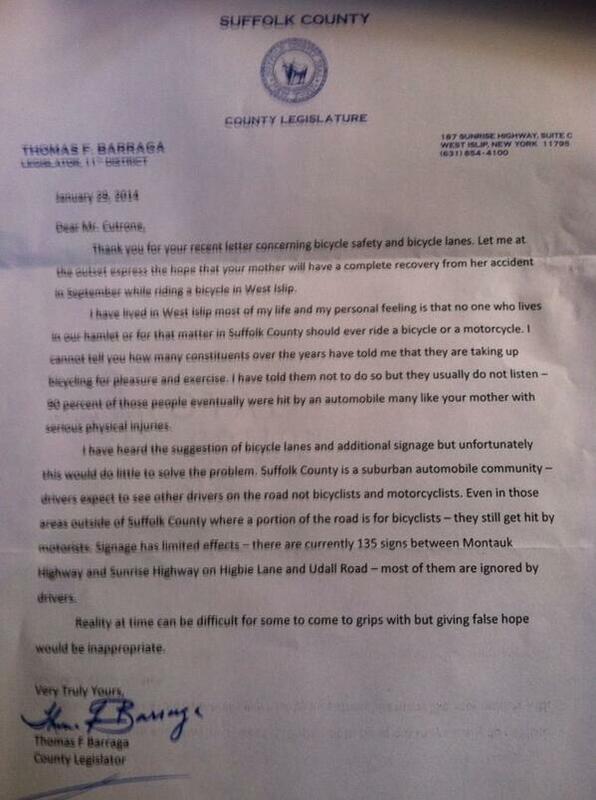 US County legislator’s repsonse to a letter from a son whose mother was hit by a car. Distributed by @bikesnobNYC and others. I’ve sent them a letter for consideration. I doubt it will get published, as it is critical of their editorial decisions, rather than glorying at the death of a cyclist. I read an article about jaywalking the other day and how in America the 20’s the car lobby shifted blame for accidents to pedestrians and the answer was to make crossing the road illegal outside of set crossings. It was a coordjnated strategey over years. Astonishing. I sometimes wonder if there is implicit sympathy with this blokes view somewhere in government. If we make it hard enough and punsishmenta lax enough cyclist wl go away, or at least go to off road paths and velodromes and some of the better ones can win us some medals every four years. he’s obviously never been on an STW forum ride beaten to it. From the evidence in that letter Alex Oliver Rigby is a weapons grade bell end. US County legislator’s repsonse to a letter from a son whose mother was hit by a car. Jesus that is truly sad! Sheesh, that guy needs to get some exercise. I hear cycling is a good way to lose weight. And that is all I have to say because that letter is not worth raising your blood pressure over. The paper appears to have form for publishing this kind of anti cycling stuff. A few years ago, a cyclist was killed on the itchen bridge, i seem to recall there being similar letters printed in the same manner. Could even be the same bloke. I understand the editor is very anti-bike and is very vocal about any organised ride in the new forest. That really is bordering on hate crime. Report to the Press Regulator. Yep, report it, that papers not in the Archant group is it? Its the sort of stuff they put in the local rags around here , their just a bunch of click hungry **** who would print anything to get a web hit. “For your own safety leave the bike at home, get in the car like any rational person would. You’ve lost the fight for your right on the road and a legal precedent has been established.” it could be described as incitement of crime and threatening behaviour in a complaint to the pcc. I wondered about ‘click’ stories this morning as I was skipping past the ususal drivel posted on facebook. How many stories now are just written to generate click through ad revenue? Usually written as a polarising view on a current hot topic that they know will rile. I wouldn’t piss on that idiot if he was on fire. I’ll bet he’s got ‘esteem issues’ (that’s therapist speak for being a sad, narrow-minded irrelevance who feels the need to affirm themselves by getting a rise out of others). Such a waste of oxygen could normally be ignored, of course, but when he’s in charge of a half-tonne of metal on wheels it is a different matter. It would be interesting if he was involved in an RTA and someone forwarded that letter to the police and his insurer. Then again, it probably wouldn’t. Remember – tossers – they are everywhere, EVERYWHERE……….. The guy has no empathy. It makes me sad to read that there are people like that in the world. Basically the sort of person who seems more in favour of a totalitarian regime then a respectful, free society. A stunning lack of sensitivity and objectivity. Not far off what the letter is saying to be honest, it was his own silly fault for cycling on the road. The van driver who killed my friend got away with it due to being dazelled by sunlight. Obviously you shouldnt slow down you should overtake and pull in running into the back of two cyclists killing one and seriosly injuring the other.